My mom barged into my bedroom telling me to get my stuff ready. Groggy and still awakening from a dream, I didn’t know why she was making a fuss. It was barely daylight. And then reality hit me, as if on Christmas morning knowing that Santa had arrived with gifts. My first panicked priority was double checking to make sure I had my fishing gear and subtropical clothes ready. Within a couple hours we were headed to Belize in search of three fish I knew little about: permit, tarpon and bonefish. At the airport in Montana, Logan (my older brother) and I couldn’t sit still; all we wanted to do was fish. We flew into Denver from Bozeman, then on to Houston. Spending the night there and following the longest 12 hours of my life, we boarded our flight to Belize arcing into morning southeastward over the Caribbean. Stepping off the plane in Belize City, I thought I was going to die. The humidity and furnace blast of heat was unbearable. Growing up in the dry air and cool nights of Montana, this wasn’t typical fishing weather for me. Finally, around noon, we hopped our last flight to the coastal flats on a small puddle jumper. Touching down in San Pedro, we were met by an employee of El Pescador, reputed to be one of the best fishing guest lodges in Central America. One boat ride later, we reached the dock on Ambergris Caye around 2 in the afternoon. Waiting for us were the lodge’s lovely staff. It is strange to be traveling into a dream. El Pescador had been one of the places on my late father’s bucket list and my mom placed it at the top of ours in honor of him. Our trip to Belize came only a few days after we spread his ashes into O’Dell Creek, a tributary of the Madison River. Now Logan and I would take everything he had taught us as we’d be casting our lines into waters of his own dreams. Being out on the flats of the western Caribbean was remarkable, the ocean smelled heavy of salt, having a turquoise color to it, and never deeper than 20 feet. Every day was hot but it was the heavy humidity that really got to Logan and me. In the morning the sun was always out so my Mom made sure we buttered ourselves in sunscreen, even beneath our Patagonia long sleeve shirts, fishing pants, and baseball caps. Otherwise, we would have been burnt to a crisp. Of all of the guides at El Pescador, Logan and I could have been assigned, we managed to bag the best one. His name was Emir Marin, but everyone called him “Gordy”, because he was a little chubby—“gordo” en Espanol— when he was little. Just like I was. Watch out for the chubby kids; eventually they grow up and defy those who sell them short. This fishing, he said, was remarkably different from what we knew, the way you cast, the way you strip and set the hook. When you are sailing line you have a much heavier weight so it can sink; the technique is called double haul, which allows you much farther reach. After you cast you strip your line in at all different speeds based on what your guide is telling you. But most challenging is how you set the hook. Instead of pulling the rod up, you strip set the hook; otherwise you will pull the fly out of the fish’s mouth. When fishing for tarpon, Gordy said you have to realize they will jump out of the water and snap the line by landing on it. To make sure the line does not snap you “bow” to the tarpon giving the line slack, so if the fish belly flops on the line it does not snap. Anglers use the term “bow” because the tarpon is also known as the Silver King, and you always bow to the king. We got into the bonefish and permit early on and often, but the big boys, members of the genus Megalops atlanticus were eluding us. 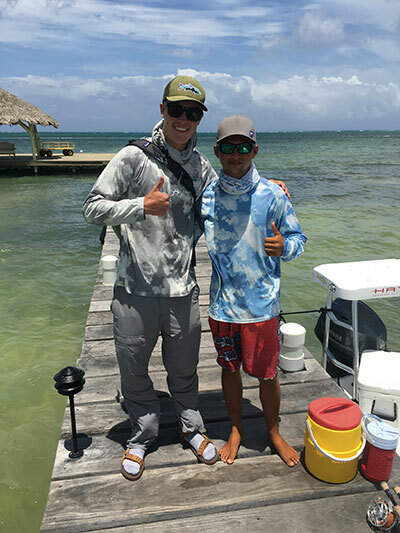 Gordy is a 20-year-old native Belizean and a third generation saltwater fishing guide. 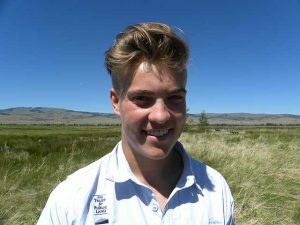 His grandfather and his father apprenticed him into being the guide he is today. Having Gordy around the same age as Logan and me, we got along really well. Within just a few short days I considered him a dear friend, and I hope we’ll rendezvous again. All of guides at El Pescador, truth be told, are fantastic, great guys and I would go fishing with any of them any day. They even turned my mother into a saltwater pescadora. Logan and I had decided to go hunting for migratory tarpon down south on Turneffe Flats. The voyage took around two hours to get there and was definitely not worth it, I thought. The weather was cloudy, dark, and a drizzle settled in. We fished for nearly two hours without a single glimpse of a fish. So we decided to head back to the flats up north where the residential tarpon prey. Every time we were out on the water heading to our destination or fishing spot, from time to time we would see a needle fish shoot out of the water next to the boat. It looked like the fish was flying, but it was just skimming on top of the water. Due to its strong needle like body it was able to fly onto the surface and keep itself up. When we finally arrived at our new destination we had already, in my thinking then, wasted five out of our eight hours of fishing, finding no tarpon. Our spirits were getting low. To travel all this way, it’s hard to imagine something existing when you don’t see it firsthand. But faith, courtesy of Gordy, had something else in mind for us. He knew. It the distance, about a hundred feet out, I spotted a large dark figure moving slowly towards us. Was it a tarpon? Without thinking I made one big cast and shot my line out landing the fly just a few feet in front of the monster. Listening very carefully to Gordy, I stripped both fast and slow. The tarpon slowly stalked the fly like the predator it was made to be. Once the tarpon was directly underneath the fly it sucked the lure into its mouth. That’s when instinct set in. I firmly grasp the line and set the hook as hard as I could. Within just a few short seconds the tarpon was on the run, and the fight began. For me, El Pescador lives up to its reputation and I understand why so many of my parents’ friends have gone there over the years with their families and on personal escapes. You don’t have to be a fisherman to appreciate the magic of El Pescador. With its white sands, long dock jutting into the sea, and palm trees with hammocks stretching from one to another, it’s what I think paradise might look like. Founded in 1974, El Pescador was the 2013 Orvis International Destination of the Year. Known for its personal touches and privacy, the lodge is a base camp and offers lots of things to do for those who aren’t into fishing. You can take guided tours of Mayan sites, go cave tubing and even get massages. Saltwater fishing for bonefish, permit and tarpon has different gear requirements from what we know in the Rocky Mountain West. Fly rods can range from 7 weights all the way up to a 12 weights. The lighter rods would be used for bonefish, the mid-range rods would be used for permit and small tarpon, and the heaver rods would be used for the bigger tarpon. The flies used to catch bonefish and permit are the same. The main fly patterns used for bonefish and permit are shrimp and crab patterns. The main patterns we used were the Rootbeer Shrimp, and the Mathews Turneffe Crab. For Tarpon, the flies are much bigger and more colorful. The flies we used were the Streaker and the Grizzly Orange Tarpon. After the most exhilarating fifteen minutes of my life I managed to bring the 40-inch beast in and land it. I held the fish up to my face with an ear to ear smile. That moment was one of the most emotional angling moments of my life. I caught a tarpon myself and had pride releasing it back into its blue-green home. Soon, tarpon began jumping out of the water. “Tarpon 10 o’clock!” Gordy would advise. Everything seemed to come together. I had it down. I knew our trip was coming to an end soon. With one more big last cast I placed my fly right in front of a huge fish. I slowly start striping my line in until Gordy yelled, “STRIP! STRIP! STRIP!” Looking back, I realize how in just a few moments our day had turned around from being the worst day of fishing to being the most exhilarating in my 16 years. Whenever I landed a fish a whole wave of sensations rolled over me; happiness, joy, sorrow. I thought of Dad. Logan and I lost nearly 10 tarpon each because we pulled our rods up until experience taught us we needed to bow. Had my father been with us, he would have been his full animated self, providing a friendly play by play broadcast giving us a loving taunting scold for every fish we missed. To catch a tarpon, he would’ve had to learn to bow too. We went to El Pescador on Belize’s San Pedro Coast based on the recommendations of friends and family who had been there before. It was the kind of place that my mom said Dad would’ve loved, all of us being there together. The resort is committed to teaching and practicing catch and release fly fishing, devoted to sustainable recreation and regulations that keep these rare fish surviving for future generations. At night, full on our gourmet dinners and exhausted from the action on the water before heading back to our super comfortable, air conditioned rooms, we would stop at El Pescador’s beachside bar. Byron the bartender was the keeper of some of El Pescador’s fishing stories. All of the guests shared their tales with him. A father in his early forties, he understood why we came and what brought us there. I would sit at the bar every evening and talk to him, and by doing so I got to know how great of a father he was. He works six weeks straight without seeing his kids, so that he can have an entire week off and more time with them on the mainland instead of six days of work and one day off. Byron’s story of working hard to give them a better life touched my heart. All of the people at El Pescador were just as nice. I asked my mom why she put this trip together. She said, “After a rough year losing Dad, I wanted to take you and Logan on a vacation. I let you pick the location and wasn’t surprised when you chose Belize, because I know how much you love to fish. I talked to several friends of ours who had been to Belize and I did my research. El Pescador got great reviews and seemed to have it all, and I was not disappointed.” Our trip turned out to be a wonderful experience and I would go back in a heartbeat.